OMG she is a doll Elina 😀 what a great capture. When your adorable children get older, and view your images of them they are going to be so glad their mom was so talented with a camera. What a great legacy 😀 Have a wonderful day. That’s so sweet of you to say Joe, thank you! 🙂 Have a wonderful day too! You two are so sweet! 😀 And, please do hop on the next flight, I think that’s a wonderful idea! 😀 Greetings to your lovely wife! A lovely portrait, Elina. She’s so cute!! No worries. 🙂 Thank you Isabel! Oh my she is precious! Look at those little lips, and those wisps of hair. Yes she is reading a book. 🙂 Thank you for a sweet comment LB! vai olikos se äiti “emä”? A really sweet picture. She seems so absorbed in her own mind. Or maybe just concentrated. 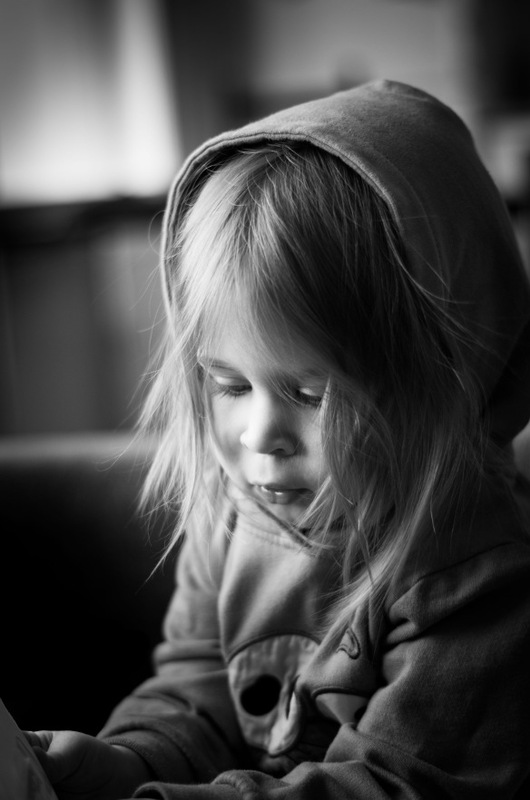 The black and white is perfect for this child portrait. This is a very, very lovely portrait. Fantastic protrait, great bw. She’s adorable. Good weekend. Oh thank you Marcos! 🙂 Have a great weekend too! Elina, I just have to comment — your little one is so very sweet.